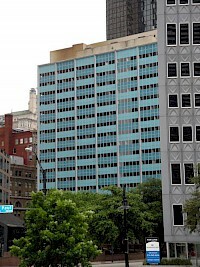 10 Lafayette Square, also known as the Tishman Building, is a high-rise office tower located in Lafayette Square Buffalo, NY. 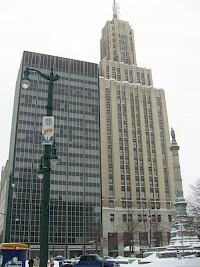 Completed in 1959, it is the thirteenth tallest building in Buffalo, standing 263 feet (80 m) and 20 stories tall. The building was home to the Fortune 500 company, National Fuel Gas until 2002 when the company relocated to the Buffalo suburb, Williamsville. 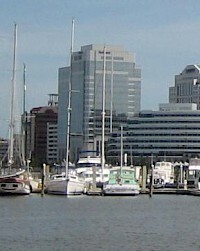 150 West Main Street is the fifth tallest building in Downtown Norfolk, Virginia, United States. In 2000, Norfolk's office vacancy rate was well below 10%. The development was a joint project between the city of Norfolk and a limited liability company headed by local businessmen Tom Robinson and Robert Stanton. The 840-space parking garage was financed by the city. The 20-story tower contains 234,000 ft of leasable space. 211 North Ervay is a high rise located at 211 North Ervay Street in the City Center District of Dallas, Texas, United States. The building rises 250 feet (132 meters) and contains 20 floors of office space. The colorful building of modernist design is situated on a prominent city corner and adjacent to Thanks-Giving Square. 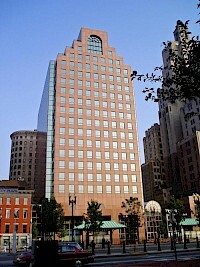 50 Kennedy Plaza (formerly known as Fleet Center) is a Postmodern skyscraper in Providence, Rhode Island. At a height of 285 ft (87m), it is currently the sixth-tallest building in the city and state. The building is named for Kennedy Plaza, which it abuts. Notable occupants with headquarters in the building include Fortune 1000 company Nortek, Inc. and private equity firm Providence Equity Partners. Its exterior façade is done in "granite framing green-reflective-glass side elevations". 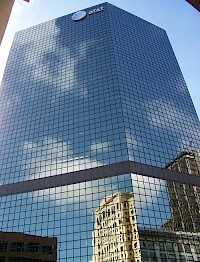 AT&T Building is the 24th tallest building in San Diego, California and is a prominent fixture in San Diego's skyline. The 20-story skyscraper has a height of 355 ft (108 m) and is located in the Horton district of Downtown San Diego. It was constructed in 1982 and was designed by architect Langdon Wilson. When a pipe bomb exploded in front of the Edward J. Schwartz Federal Courthouse in May 2008, some of the shrapnel hit the AT&T Building eight stories up. The Atlantis Condominium is a landmark 20-story luxury condominium in Miami, Florida. It was built between 1980-1982 and was designed by the architectural firm Arquitectonica. 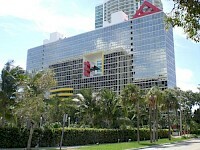 The building is known for its glass facade and primary color scheme and the 5-story palm court which is cut out of the building. The palm court features a red spiral staircase, a jacuzzi, and a palm tree. 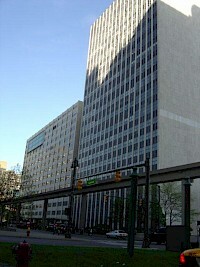 The Cadillac Square Building (Also known as the Real Estate Exchange Building) is a demolished building located at 17 Cadillac Square in Detroit, Michigan. It was constructed in 1918, finished in 1919. It was destroyed in 1978 and stood at 20 floors, with two basement floors, for a total of 22 stories. The high-rise was designed by architect Louis Kamper in the neo-gothic architectural style and shared similar characteristics and proportioning to the neighboring Cadillac Tower. The Coleman A. Young Municipal Center is a government office building in Downtown Detroit, near Hart Plaza, One Detroit Center and the Renaissance Center. Originally called the City-County Building, it was renamed for former Detroit Mayor Coleman A. Young, after his death. The international style, high-rise building was constructed in 1951, and completed in 1954. It is 20 floors high, with one basement floor, for a total of 21. 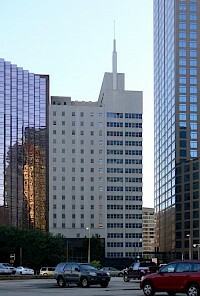 Corrigan Tower, also known as 1900 Pacific, is a high rise located at 1900 Pacific Avenue in the City Center District of Dallas, Texas. The building contains 20 floors of office space and is of modernist design. It is situated on the high-traffic corner of St. Paul Street, Live Oak Street and Pacific Avenue, across from Aston Park and the future Pacific Plaza Park. It lies within the Harwood Historic District, but it not a contributing structure.